Yesterday Chris and I put the finishing touches on EVERYTHING that we had left to do in preparation for Saturday. We had a meeting at the reception venue last night at 6pm where we had to drop off absolutely everything that would be needed on the big day, the seating chart, place cards, favours, cake knife..... Yesterday was a busy day of wrapping things up, but now we're pretty much done! Now we get to sit back, welcome all our friends and family who are coming into town, and really enjoy our wedding. Here is a peak at another thing we finished off yesterday, my mom and sister came by to help me tie the yarn around the ceremony programs. Cute eh? Those tiny little bows are the only place that yarn managed to sneak in to the details of our day. We were going to use ribbon, but then realized that we would have to buy like 10 roles at almost $6 a piece we were thinking that we really didn't want to spend more money, even though $60 isn't a make-it-or-break-it kind of number, we've just mentally put our foot down, no more spending! Then my mom came up with the brilliant idea of using yarn! And I love it. Because we both work with yarn all day, we didn't want to have an entire yarn-themed wedding, but just a touch really makes me smile. 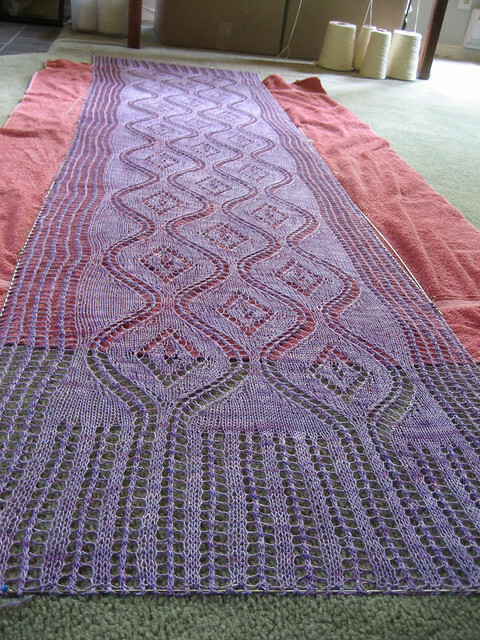 I also finished blocking my moms Mother of the bride stole yesterday. I don't think I've blogged about it once, in theory I was trying to keep it a surprise. I think that my mom was getting a little nervous, she knew that I was making her something, but I hadn't mentioned it in weeks, I think she thought that in all the chaos of the move and wedding planning that I had forgotten. Ha! No, not forgotten, just sneaky. I gave her the stole yesterday and I think she really loves it. We'll get some great shots of it this weekend with her hair all done and in her gorgeous dress. My mom is usually quite casual and understated, but she's really pulling out all the stops for the wedding, she's going to look gorgeous and I can't wait to see her all dolled up! The pattern is the Seascape Stole, I added a repeat to the length to get a nice long stole, it measures nearly 80 inches long! I also added some extra eyelet rows to either side. I dyed my Silver label Mulberry Silk yarn in a custom colourway to complement mom's dress and skin tone. So, now the fun can really begin! Today we clean our house and for the first time try to really get it ready for company, my family is starting to arrive today we're having about 20 people over for supper tonight! Chris is cooking, mom and dad are helping, I can't wait! I probably won't post again before the wedding, so wish us luck, pray for good weather! I'll be back with a full post soon after.